▬ Kriterji mill-Isqfijiet Maltin għall-Applikazzjoni ta' Kapitlu VIII tal-Amoris Lætitia. 08/01/2017. ▬ L-Arċisqof Monsinjur Charles Scicluna waqt il-preżentazzjoni tal-Edizzjoni bil-Malti tal-Amoris lætitia. 30/10/2016. ▬ Monsinjur Arċisqof Charles Scicluna. Diskors fl-aġġornament tal-Kleru. Seminarju, tal-Virtù, Rabat. 26/05/2016. [audio]. ▬ Sintesi tad-diskors tal-Isqof Mario Grech dwar l-Amoris Laetitia. Seminarju, Għawdex. 04/06/2016. ▬ L-Isqof ta' Għawdex Mario Grech bl-ewwel reazzjonijiet tiegħu dwar Amoris Laetitia. 09/04/2016 [video]. ▬ L-ewwel tliet kapitli tal-A.L. Kumm. Teoloġika Interdjoċesana. Dun Pawl Sciberras, Dun Ray Zammit, Dun Richard-Nazzareno Farrugia. 31/05/2016. ▬ Ir-raba' u l-ħames kapitlu tal-Amoris lætitia tal-Papa Franġisku. Kummissjoni Teoloġika Interdjoċesana. Dun Hector Scerri. 08/06/2016. ▬ Is-sitt u s-seba' kapitlu tal-Eżortazzjoni Appostolika tal-Papa Franġisku, Amoris lætitia. Dr Pauline Dimech. 17/06/2016. ▬ It-tmien kapitlu tal-Eżortazzjoni Appostolika tal-Papa Franġisku, Amoris lætitia. Dr Nadia Delicata. 28/06/2016. ▬ Id-disa' kapitlu tal-Eżortazzjoni Appostolika tal-Papa Franġisku, Amorist lætitia. Dun John A. Berry. 06/07/2016. ▬ L-Ewwel Programm. Introduzzjoni għall-Eżortazzjoni. ▬ Is-Sinodu tal-Isqfijiet dwar il-Familja, Ottubru 2014. ▬ Is-Sinodu tal-Isqfijiet dwar il-Familja, Ottubru 2015. ▬ Intervent tal-Kardinal Schonborn waqt il-preżentazzjoni tal-Eżortazzjoni Appostolika tal-Papa Franġisku, Amoris Laetitia. 08/04/2016. ▬ Kriterji bażiċi għat-twettiq ta' Kapitlu 8 tal-Amoris Laetitia. Ittra mill-Isqfijiet tar-Reġjun ta' Buenos Aires lis-Saċerdoti. 05/09/2016. ▬ Ittra tal-Papa Franġisku lill-Isqfijiet ta' Buenos Aires dwar il-kriterji bażiċi għat-twettiq ta' kapitlu 8 tal-Amoris Laetitia. 08/09/2016. Amoris Lætitia. Kliem il-Papa Franġisku fuq l-Imħabba. Preżentat mid-Djaknu Carl Scerri bil-kortesija ta' Radju Leħen il-Qala. ▬ L-Ewwel Programm. Kapitlu I u Kapitlu II. ▬ It-Tieni Programm. Kapitlu III u Kapitlu IV. ▬ It-Tielet Programm. Kapitlu V u Kapitlu VI. ▬ Ir-Raba' Programm. Kapitlu VII, Kapitlu VIII u Kapitlu IX. ▬ Dun Kevin Schembri. Amoris Laetitia u aspetti partikulari tat-tmien kapitlu. Konferenza fl-aġġornament tal-Kleru Ġunju 2016. ▬ Dun Kevin Schembri f'seba' filmati qosra dwar il-kapitli differenti tal-Amoris Lætitia. ▬ Mgr Edward Xuereb. Novelty of 'The Joy of Love. Times of Malta. 22/02/2017. ▬ Konferenza Stampa mill-Vatikan li matulha kienet preżentata l-Amoris Lætitia 08/04/2016. ▬ Cardinale Christoph Schönborn. Amoris Laetitia, atto di Magistero colmo di Misericordia. 08/07/2016. ▬ Archdiocese of Philadelphia. Pastoral Guidelines for Implementing Amoris Laetitia. 01/07/2016. ▬ Archbishop Cupich discusses Apostolic Exhortation Amoris Laetitia. 08/04/2016 [video]. ▬ Cardinal Donald Wuerl on Amoris Laetitia, Conscience and Truth. 08/04/2016 [video]. ▬ Cardinal Donald Wuerl. 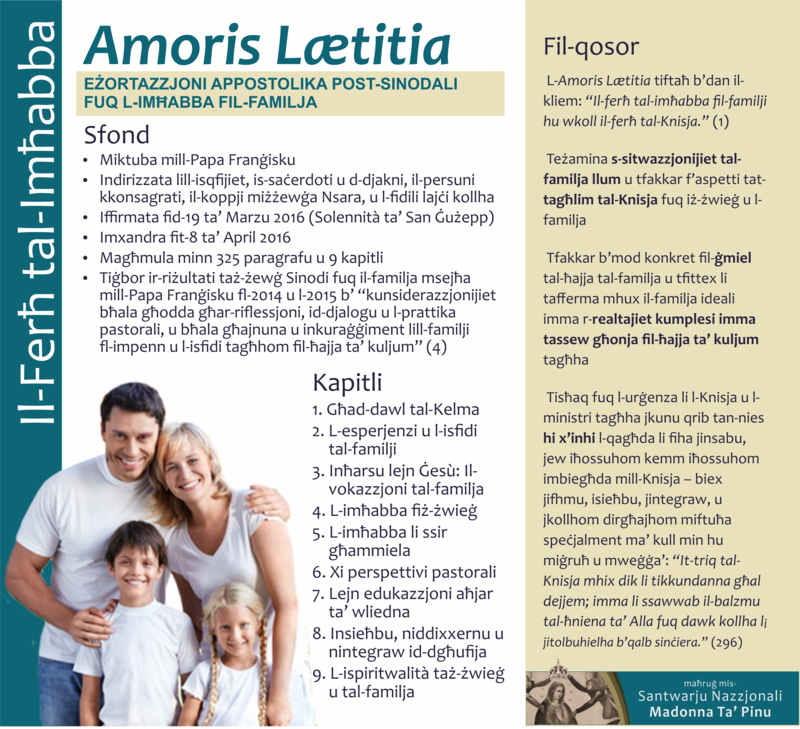 Amoris Laetitia: The recent Synods and the Church's Ancient Teaching on the Family. 27/04/2016 [video]. ▬ L-Isqof Robert Barron dwar l-Amoris lætitia u l-akkumpanjament tal-persuni. [video]. ▬ Bishop Peter Doyle on Amoris Laetitia. 08/04/2016 [video]. ▬ Archbishop Julian Porteous, Archdiocese of Hobart. The family as the place of love. 08/04/2016 [video]. ▬ Bishop Robert Barron's first thoughts on Amoris Laetitia. 08/04/2016. ▬ That's "Amoris". Dun Brendan Gatt dwar l-Eżortazzjoni Appostolika, Amoris Laetitia. Newbook. 11/04/2016. ▬ Dun Richard N Farrugia dwar l-Amoris Laetitia. Radju Margerita, Ta' Sannat [audio]. ▬ Il-Ferħ tal-Imħabba. Fuljett maħruġ mis-Santwarju Nazzjonali Madonna ta' Pinu. 08/04/2016. ▬ Marriage and the Family: Through the Lens of Amoris Laetitia. D. Bean, S.Bollman, C. West and A. Mitchell. uCatholic Webinar. 27/05/2016 [video]. ▬ Fr Tony Kerin and Madeline Dugdale discuss Amoris Laetitia, Archdiocese of Melbourne. 08/04/2016 [video]. ▬ L'esortazione del Papa sulla famiglia. L'approfondimento in studio di Giacomo Galeazzi, vaticanista. TV2000. 11/04/2016 [video]. ▬ The Joy of Love. Ten very important points in Pope Francis' Amoris Laertitia about Love in the Family. 08/04/2016. ▬ Rocco Buttiglione, Il-Ferħ tal-Imħabba li fixel lit-Teoloġi. Osservatore Romano, 20/07/2016. ▬ Rocco Buttiglione. Amoris laetitia takes step in the direction marked by Wojtyla. Vatican Insder, 30/05/2016. ▬ Fr James Martin sj, Top five takeaways from Amoris Laetita. 08/04/2016 [video]. ▬ Amoris Laetitia, Start with Chapter 4. Thomas Reese. Faith and Justice, National Catholic Reporter. 08/04/2016. ▬ Pope Francis on the modern family. What we learned from Amoris Laetitia. 08/04/2016. ▬ La Chiesa non condanna il peccatore. Enzo Bianchi commenta l'Amoris Laetitia. 09/04/2016. ▬ John L. Allen Jr. Pope Francis lets the world in on the Church's best-kept secret. Crux, Taking the Catholic Pulse. 08/04/2016. ▬ Camila Domonoske. Some relationship advice from Pope Francis. NPR. 08/04/2016. ▬ Andrea Gagliarducci. Interpreting Amoris Laetitia through the lens of Catholic tradition. Catholic News Agency. 08/04/2016. ▬ R. R. Reno. A Stubborn Givenness. First Things. 11/04/2016. ▬ James Martin sj. Discernment: A key to Amoris Laetitia. America. 07/04/2016. ▬ Deacon William T. Ditewig. Amoris Laetitia. We advance together, the strong helping the weak. 08/04/2016.